You’ve completed your nurse assistant training and maybe put in a few hours providing direct patient care. You’re enjoying your new job and look forward to a long and rewarding career of helping others. So what do you do when an unexpected situation arises that requires relocation to another state? Whether your relocation is due to life’s circumstances, a new job opportunity or something else, it’s possible to transfer your license and begin working as a CNA in another state. However, unlike other careers, it is not as simple as applying for a job and picking up where you left off. CNA certification and licensing is state specific, meaning every state has individual requirements with regards to training and certification. So when life throws you a curve ball, the first thing you need to do is recertify in the new state before you begin working there. Transferring your certification is, for the most part, a simple process. However, the process might require a few extra steps in some states. As it currently stands, there are two options for CNAs who want to transfer to another state. The first option is simple, if your home state shares reciprocity with your new state. If not, you’ll need to retake the nurse aide evaluation in the new state in order to recertify. Since every state employs different policies for CNAs, you’ll have to check with the Nurse Aide Registry of your future state to determine the exact requirements for recertification. The following provides an overall guideline of the steps for transferring your license to begin working as a CNA in another state. Some states have reciprocity with one another. Reciprocity is the process where active, certified nurse aides transfer their license to the new state for employment purposes. If your current and future states share reciprocity, the new state will accept your license as if they had issued it themselves. In other words, you won’t need to retake the nurse aide evaluation – which will shorten the process of certification in the new state. Note: Send copies of the documents; not the originals. Provide your mailing address, e-mail address and phone numbers along with the instructions (new address) where the registry could mail your new certification. The mandatory FBI background check could delay the process by as much as eight weeks. Therefore, you should contact the registry early to make the necessary arrangements and avoid delays. Expect the transfer to take at least two months to complete. Some states will let you work, with some restrictions on time while you await the transfer. The nurse aide registry may require the previous registry to complete a segment on the reciprocity application. Therefore, you should maintain contact with both registries in order to provide required information to expedite the process. 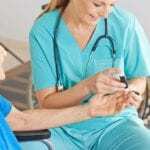 If your existing and new states do not share reciprocity, you’ll have to take the state’s nurse aide evaluation comprising of the written and skills test. Also, the new state may require you to take additional courses if your previous training is not comparable with that of the new state. Contact the nurse aide registry first, to find out what the testing and training requirements are for transferring your license. If you’ve had your certification for a while before you relocate, you should check the expiration and complete the transfer process before the license expires. Expired or inactive licenses take longer and require additional steps to transfer.